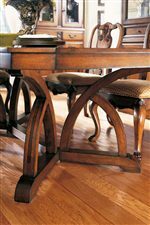 Gentle curves and a scalloped edge define the Barrel Head Table. A scrolled decoratve border on top contrasts a Starburst veneer pattern, while a waxy distressed finish adds depth. Perfect used as a chairside table or nightstand, this piece is highly versatile. Overall size : 28D x26H in. The RayLen Vineyards Round Wood End Table by Fine Furniture Design at Malouf Furniture Co. in the Foley, Mobile, Fairhope, Daphne, and Gulf Shores, AL area. Product availability may vary. Contact us for the most current availability on this product. Case Construction All cases feature framed wooden dust-proofing panels between drawers, protecting drawer’s contents and adds strength. Wooden back panels are secured with screws adding strength and a refined look. Drawing design inspiration from the French countryside and furnishings often seen in the lovely estates throughout Europe and California’s wine country, This Collection embodies the relaxed lifestyle that takes pleasure in entertaining, delicious wines, distinctive home furnishings and fine food. 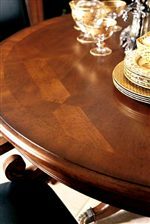 Within the collection are furniture pieces for the bedroom, dining room and entertaining that have been crafted from Vintage cherry veneers, and Asian walnut, finished in colors that emulate the warm colorations of a chardonnay, Merlot or a black currant. Pieces within the collection have subtle country French design inspirations with a hint of Louis Philippe. Generous hand-carvings with vine & leaf, scroll-shaped feet, linear reeding and the character of fine antiques that have been lovingly cared for, shape this collection. A dramatic mirror with hand-carved corners has its carvings accented with silver leaf. Gracefully turned legs, gently shaped aprons and hardware capturing a woven ribbon motif, also grace the collection. The RayLen Vineyards collection is a great option if you are looking for Traditional furniture in the Foley, Mobile, Fairhope, Daphne, and Gulf Shores, AL area. Browse other items in the RayLen Vineyards collection from Malouf Furniture Co. in the Foley, Mobile, Fairhope, Daphne, and Gulf Shores, AL area.